Pen-pushing health and safety experts are being blamed for the latest “ban” to afflict children. 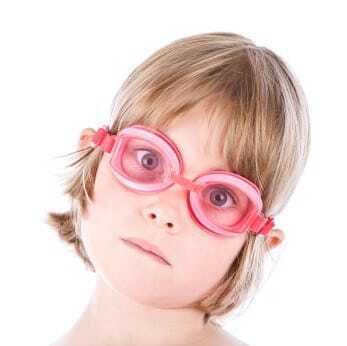 In another example of “health and safety gone mad” children in in Oxfordshire are being banned from wearing goggles when swimming because there is the “danger” that these protective devices might snap onto a youngster’s face too hard. I kid you not. The chlorine stinging their eyes is clearly something not to worry about then. Now, already you might be seething inside. You will either be angry at those “pen pushers” or the “health and safety police”, or you will be on their side thinking they have done the right thing. Nothing polarises views as much as health and safety relating to children it seems. But if you think this really is “health and safety gone made” you probably have a picture in your mind of the kind of Oxford-based pen-pusher who authorised this decision. As hard as you try not to, you have a stereotypical “health and safety expert” in your mind’s eye. But the fact of the matter is, health and safety experts save thousands of lives each year. Gosh without them, we’d all be driving around in cars without seat-belts and the road death toll would be at least double what it is now. So, health and safety isn’t all bad. Yet, whenever the next health and safety ruling raises it’s head, those poor health and safety people take a bashing – judged not by their actions, but by their stereotypes which we create without much knowledge or thought. Yet, for many businesses having a stereotype of their customers can be helpful. For instance, some companies create several different “profiles” to show they understand their typical customers. And online you can find this in several websites – for instance, if you are Customer Type A, click here, if you are Type B click here instead. And therein lies a problem. New research shows that when we know we are being stereotyped we are much less likely to play ball. The study from the University of Minnesota showed that when people know they are being classified by someone trying to sell something to them, they are less likely to buy. So, if your website makes it clear you know you have various kinds of customer groups you are actually reducing your potential for sales. Revealing to your potential customers that they have been profiled in some way and that you are directing them towards pages which are “their kind” will make it less likely that they click that “Buy Now” button. However, here’s the conundrum; in order to boost sales you need to provide specific offerings to particular target groups. But if you reveal you know they are in that target group, they reject your offer. So how can you get out of that problem? The answer is simple; make them think this sales offer is completely personal. It is purely for them as an individual. What that means is increasing the personalisation aspects of any e-commerce website you run. Plus it means having individual sites for your target groups, so that when people land on them they think this site is purely for them. A single-purpose site is more likely to achieve sales because people cannot easily see they are – in fact – being stereotyped. They are obviously being stereotyped if you have different buttons or menu options for different categories of custom – and it is this obviousness of stereotyping which causes the problem. It is yet more evidence that online, at least, you need to build ever narrower niche websites. It is more support for the notion that one website does not fit all and that businesses actually need dozens of sites, if not hundreds. But that might make your fingers have to do a lot of keyboard work, which I guess raises all sorts of health and safety issues…!